More than 82,000 well-wishers paid their respects to Emperor Akihito, who turned 85 on Sunday. TOKYO — More than 82,000 well-wishers paid their respects to Japan's Emperor Akihito on Sunday as he turned 85, his last birthday celebration at Tokyo's Imperial Palace before stepping down next year. 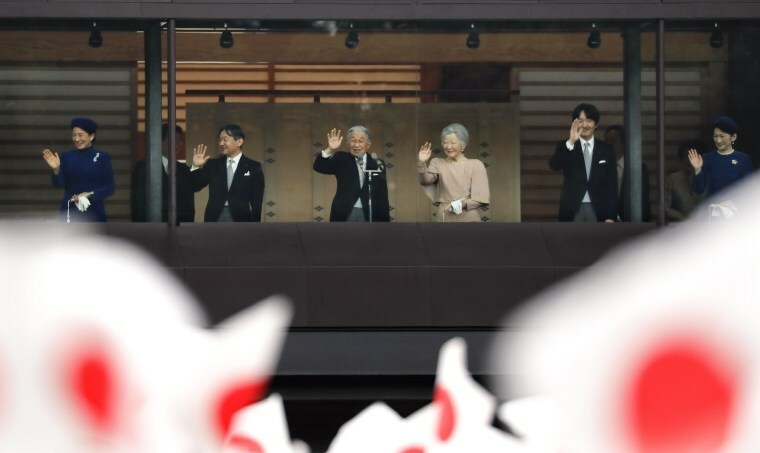 Tens of thousands of well-wishers who gathered at the palace to celebrate the occasion cheered and waved small rising-sun flags as Akihito and his family appeared on the balcony to greet and thank them. Akihito's three-decade reign — known as the "Heisei" era, which means "achieving peace" in Japanese — will come to an end when he abdicates on April 30 to be succeeded by his eldest son, Crown Prince Naruhito. Akihito has had heart surgery and treatment for prostate cancer. He has spent much of his reign addressing the legacy of World War Two, which was fought in the name of his father. “It gives me deep comfort that the Heisei era is coming to an end, free of war in Japan,” Akihito, his voice trembling with emotion, said at a news conference at the palace that was recorded this past week and released Sunday. "It is important not to forget that countless lives were lost in World War Two...and to pass on this history accurately to those born after the war." Akihito is the first emperor enthroned under Japan’s postwar pacifist constitution as a symbol with no political power, unlike his father who was revered as a god until the end of the war. His conciliatory stance contrasts with gestures made by Prime Minister Shinzo Abe, who has adopted a less apologetic tone over Japan's past military aggression. Akihito also referred to foreign workers, saying he hoped that "the Japanese people will be able to warmly welcome as members of our society those who come to Japan to work." As crown prince and emperor, Akihito has tried to bring the secluded palace close to the people, and thanked everyone including his wife Michiko, a commoner, for understanding his views and supporting his work. “As I come to the end of my journey as emperor, I would like to thank from the bottom of my heart the many people who accepted and continued to support me as the symbol of the state,” he said, and reiterated his respect and adherence to the war-renouncing charter and his symbolic role. “I intend to carry out my duties in that capacity and shall continue to contemplate this question as I perform my day-to-day duties until the day of my abdication,” he said.